Simon Anderson “The Original Thruster”. 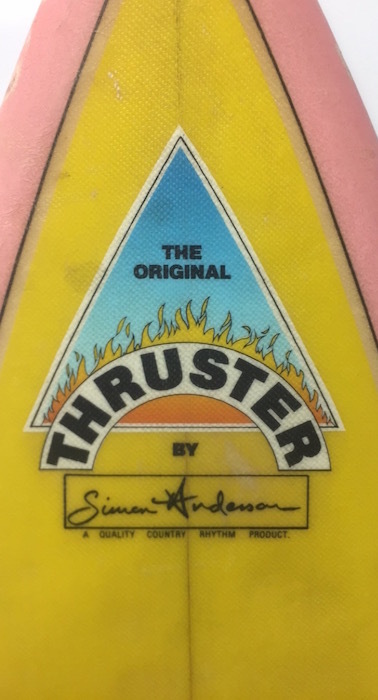 This is one of the first generation of thrusters created by Simon Anderson in 1981/82. 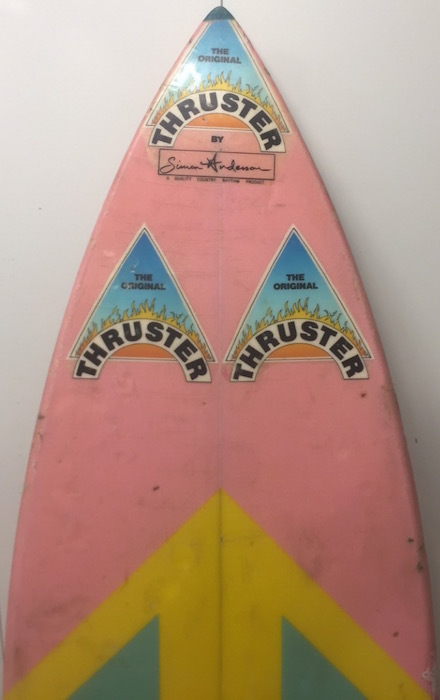 The thruster board design is still impacting modern surfboard design nearly 40 years later. 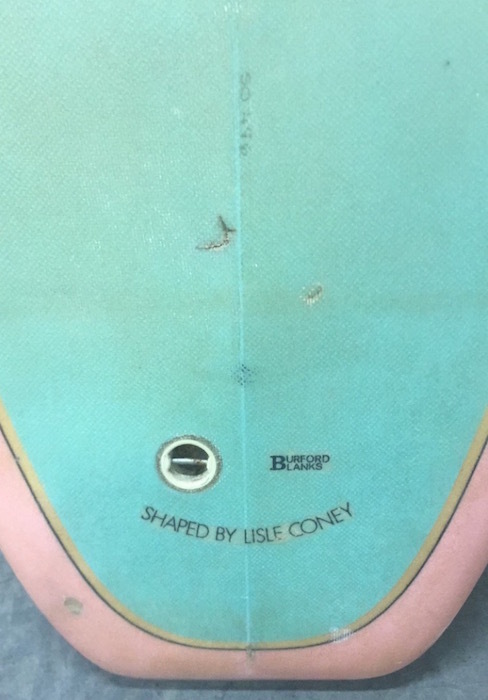 This particular board was made in South Africa by Country Rhythm Surfboards, shaped by Lisle Coney. 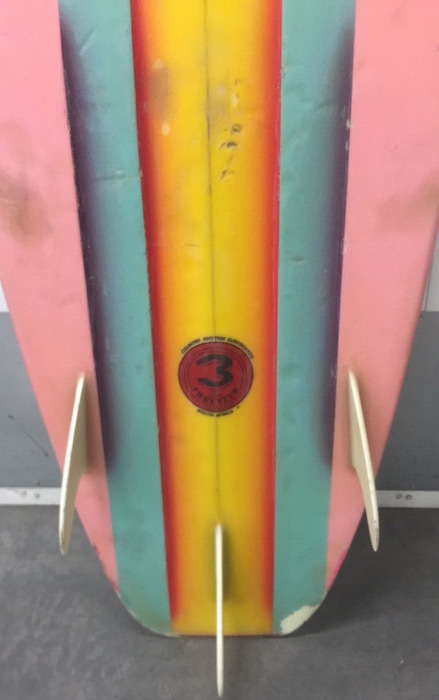 Truly an amazing piece of surfing history and a rare find. “Simon Anderson grew up in the Northern Beaches area of Sydney, Australia with three brothers. His family lived in a house that overlooked Collaroy Beach. In 1977, he won the junior division at the Bells Beach Classic Easter competition and began shaping surfboards in the Sydney suburb of Brookvale. In 1975, Anderson started his own surfboard factory, Energy Surfboards, in Brookvale. In 1977 he won the Bells Beach Classic competition and the Coke Surfabout in Sydney. 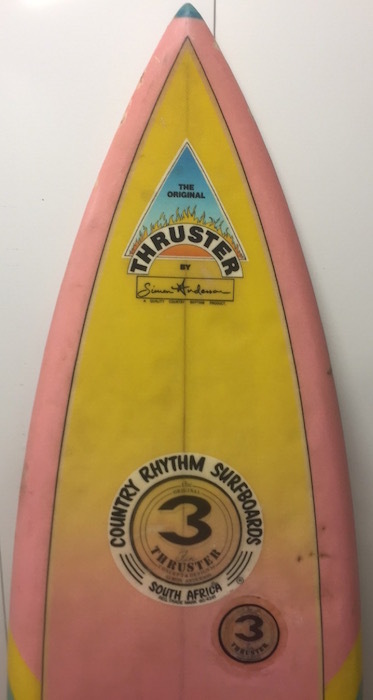 In October 1980, after seeing a twin fin surfboard with a “trigger point” fin Anderson had the idea for a new version of the existing three fin design which was later dubbed the “thruster”. Anderson created a prototype for the “thruster” design and took it on tour with him to Hawaii and California. 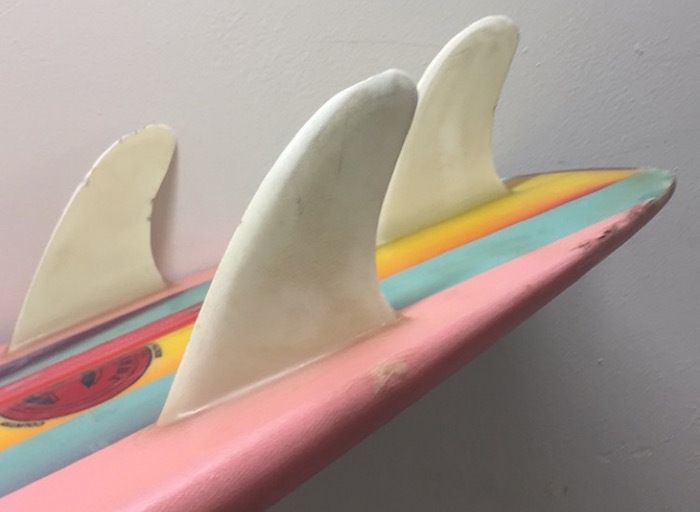 When he returned to Sydney, he made two more surfboards with similar designs. Using one of those surfboards, he again won the competition at the Bells Beach Classic in 1981 and “surfing history took its biggest turn since polyurethane foam” as the “thruster” design became the most popular fin design for surfboards over the next 30 years. Anderson retired from professional surfboarding in the mid-1980s and never sought to benefit commercially by patenting his invention. Anderson said: “If I didn’t come up with it right then, there were a lot of other people at the time that were working toward that same end goal. I’m just fortunate, and happy to contribute.” In November 2000, Anderson was awarded the Australian Sports Medal for services to surfboard design. In August 2010 Anderson was honored by US Blanks at the Sacred Craft Expo in San Diego California. In 2011, Anderson published his autobiography called Thrust: The Simon Anderson Story and was inducted into the Surfer’s Hall of Fame.